Controls the current that is applied from the ECM (terminals No. 15, No. 16) to the throttle actuator control motor (terminals No. 1, No. 2). ECM varies the direction and the amperage of the current that is applied to the throttle actuator control motor in order to control the opening of the throttle valve. The voltage difference between the throttle position sensor output voltage and the throttle position sensor output at the throttle actuator control motor relay off is smaller than the specified value. Battery positive voltage is higher than 8.3 volts. The output voltage of the throttle position sensor (main) minus the proposed output voltage becomes 0.1 volt or more. The output voltage of the throttle position sensor (sub) minus the proposed output voltage becomes 0.1 volt or more. The drive duty of the throttle actuator control motor is 100 percent or more. The proposed output voltage minus the output voltage of the throttle position sensor (main) becomes 0.1 volt or more. The proposed output voltage minus the output voltage of the throttle position sensor (sub) becomes 0.1 volt or more. The output voltage of the throttle position sensor (main) minus the learning value of the middle -opened degree becomes 0.2 volt or less for 0.4 second. The output voltage of the throttle position sensor (sub) minus the learning value of the middle -opened degree becomes 0.2 volt or less for 0.4 second. 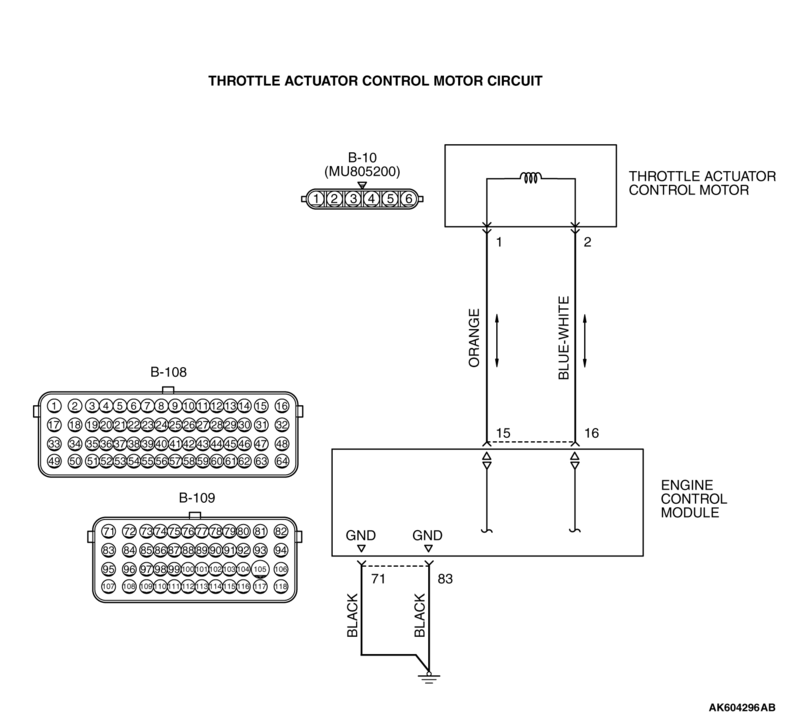 Throttle actuator control motor failed. Open throttle actuator control motor circuit, harness damage or connector damage. STEP 1. Check harness connector B-10 at throttle actuator control motor for damage. Q. Is the harness connector in good condition? Repair or replace it. Refer to GROUP 00E, Harness Connector Inspection . Then go to Step 9. STEP 2. Check the throttle actuator control motor. 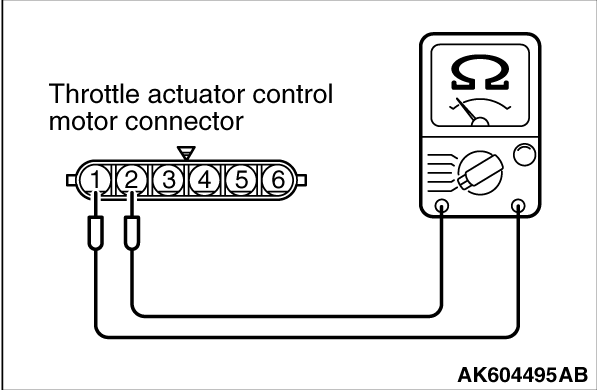 (2)Measure the resistance between throttle actuator control motor side connector terminal No. 1 and No. 2. Q. Is the measured resistance between 0.3 and 80 Ω [at 20°C (68°F)]? Replace the throttle body assembly. Then go to Step 9. STEP 4. 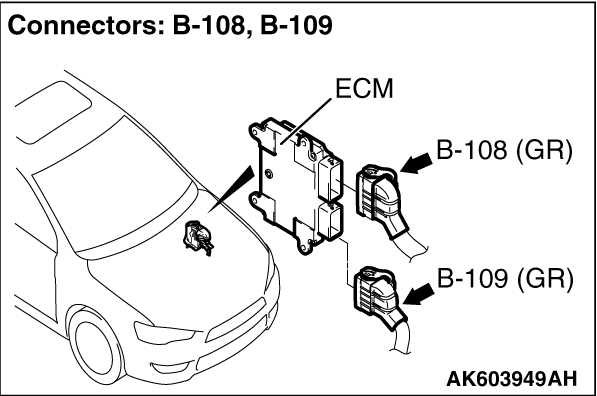 Check the continuity at ECM harness side connector B-109. (1)Disconnect the connector B-109 and measure at the harness side. (2)Measure the continuity between terminals No. 71, No. 83 and ground. Repair harness wire between ECM connector B-109 (terminals No. 71, No. 83) and ground because of open circuit or harness damage. Then go to Step 9. STEP 5. Check harness connector B-108 at ECM for damage. STEP 6. Check for open circuit and harness damage between throttle actuator control motor connector B-10 (terminal No. 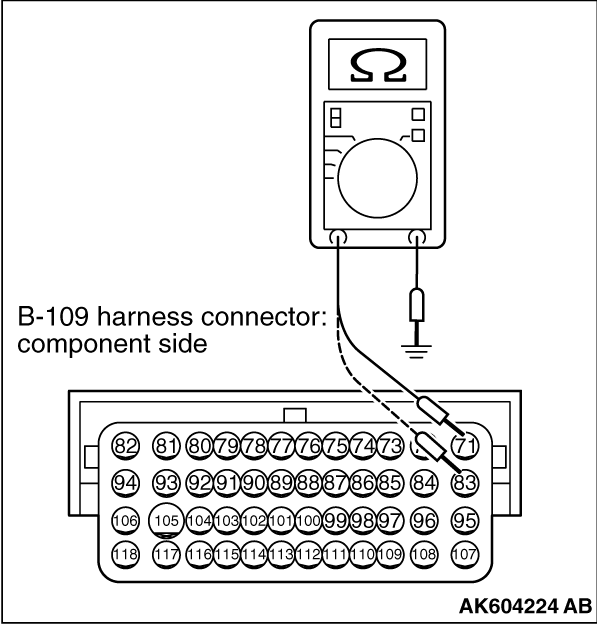 1) and ECM connector B-108 (terminal No. 15). Q. Is the harness wire in good condition? Repair it. Then go to Step 9. STEP 7. Check for open circuit and harness damage between throttle actuator control motor connector B-10 (terminal No. 2) and ECM connector B-108 (terminal No. 16). STEP 8. Using scan tool MB991958, read the diagnostic trouble code (DTC). caution To prevent damage to scan tool MB991958, always turn the ignition switch to the "LOCK" (OFF) position before connecting or disconnecting scan tool MB991958. (1)Connect scan tool MB991958 to the data link connector. (2)Turn the ignition switch to the "ON" position. (3)After the DTC has been deleted, read the DTC again. (4)Turn the ignition switch to the "LOCK" (OFF) position. Q. Is DTC P2100 set? Replace the ECM. When the ECM is replaced, register the ID code. Refer to GROUP 42B, Diagnosis - ID Code Registration Judgment Table <Vehicles with KOS> or GROUP 42C, Diagnosis - ID Codes Registration Judgment Table <Vehicles with WCM> . Then go to Step 9. It can be assumed that this malfunction is intermittent. Refer to GROUP 00, How to Use Troubleshooting/Inspection Service Points - How to Cope with Intermittent Malfunctions . STEP 9. 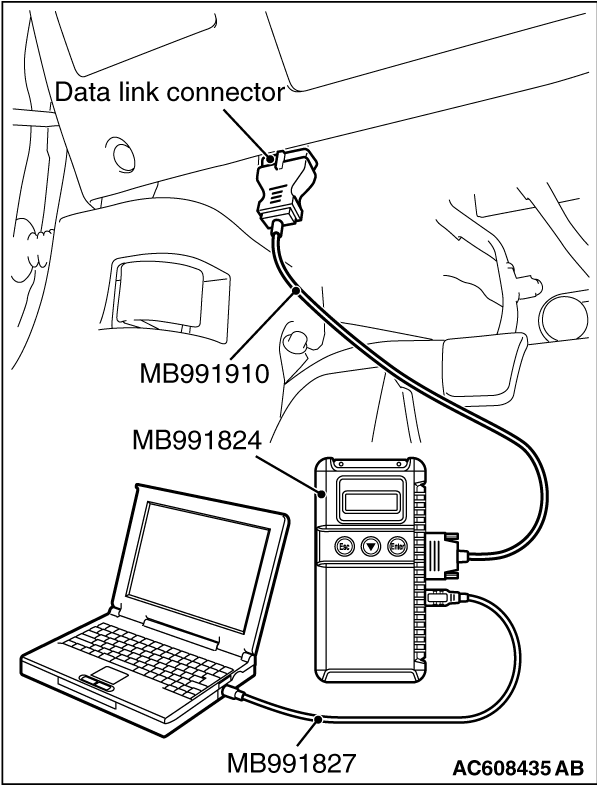 Using scan tool MB991958, read the diagnostic trouble code (DTC).